As most of you know, parenting can be crazy-scary at times. We often coast from undesirable incident to undesirable incident just trying to survive. Any “fight” that we had planned to bring to the parenting battle has long fizzled away…replaced with fear, doubt, and often hopelessness. We all want our kids to turn out good…or at least okay, right? But sometimes it’s just SO. VERY. HARD to fight for them. So we drop our guard and relax a little bit. No big deal, right? Last Sunday night, BJ and I learned the lesson of a lifetime when it comes to warring for our kids…. After church let out, we spent the rest of the day celebrating family birthdays. Despite it being a school night, we let the kids stay up late to enjoy a card game with their Granna and Aunt and Uncle that were visiting from out of town. The game ended around ten o’clock and we began the nighttime routine of getting kids and teeth clean, prepared for school, and prayed over. BJ and I were exceptionally tired and soooooo ready to climb into bed when our 16 year-old son, Josiah, came to us wanting to talk. He had been prayed over by all of our church members earlier that morning and we immediately knew that the prayers and declarations over him had caused some things to begin to break off of him. 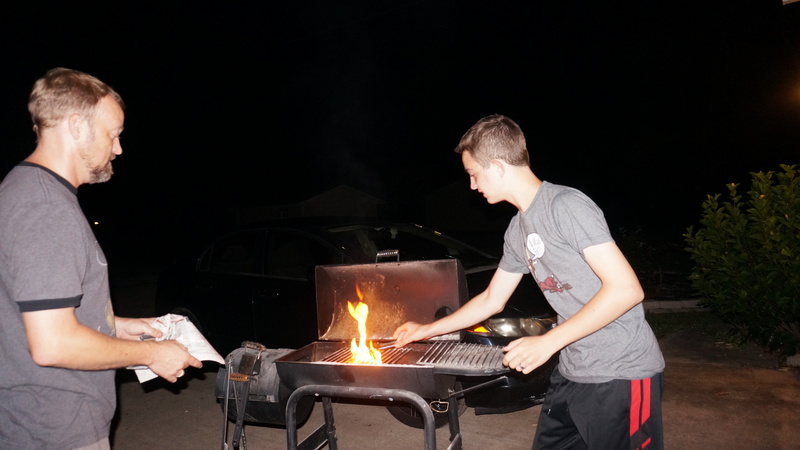 After a few hours of sharing and counsel, confession and repentance, prayer and “spiritual house cleaning,” BJ stated that he felt that we needed to burn a particular reminder of Josiah’s past. Well, this is nothing out of the ordinary for our family. Any time we sense that something is not of the Lord or that something might be opening doors in our lives spiritually that do not need to be opened, we throw it out in the yard and burn it. 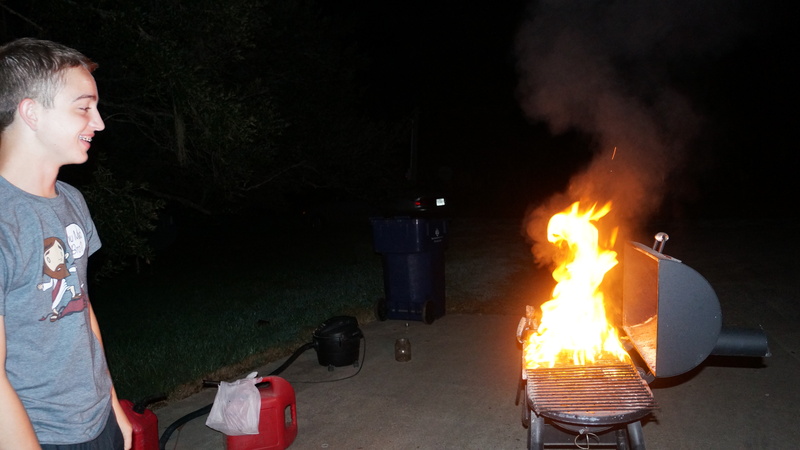 So, sometime around 1:30 am, BJ rolled his bar-b-q grill over to the driveway, doused the object with diesel, lit it up, and Josiah spoke strongly to the enemy of God ( Satan). Josiah cried out to the Lord in repentance and prayed for God’s forgiveness. We were absolutely exhausted physically and spiritually, but it was so very worth it to see God delivering our precious son from sin. The fire began to die down after some time and BJ reached for the diesel again. I immediately “nagged” that there was no need to do any more. We had already destroyed the reminder of past sin and we needed to go to bed. (BJ gets up very early for work and I was very concerned about how late it was.) BJ responded, “It’s just DIESEL Julie. 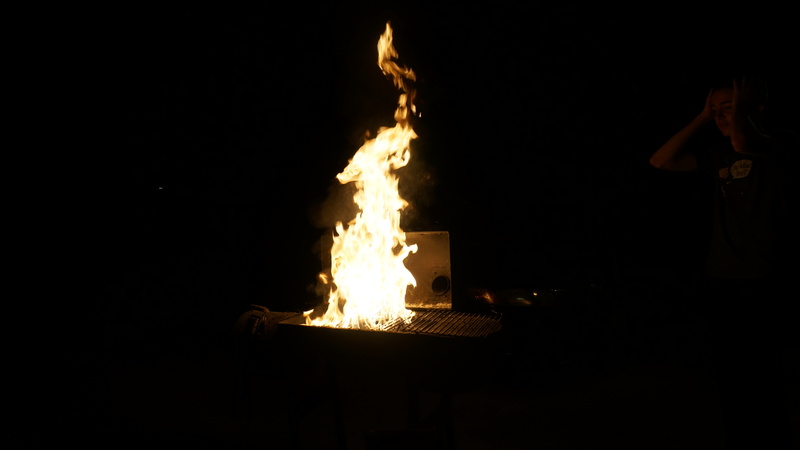 It’s fine.” (I had already been worried and uncomfortable about him using a fire accelerant-AS I ALWAYS AM- and he had already assured me many times that it was “JUST DIESEL.”) My face was turned away from the grill but I instantly knew that something had gone very wrong. I could hear a roar and I could feel that the flames and heat were much different than the first time he put the diesel on the fire. I turned my head to see that not only was the grill on fire, but also the stream of fuel pouring out of the can, and also the can in BJ’s hand. Confused, BJ cried out, “That shouldn’t have happened!” and he threw the burning can a short distance away. 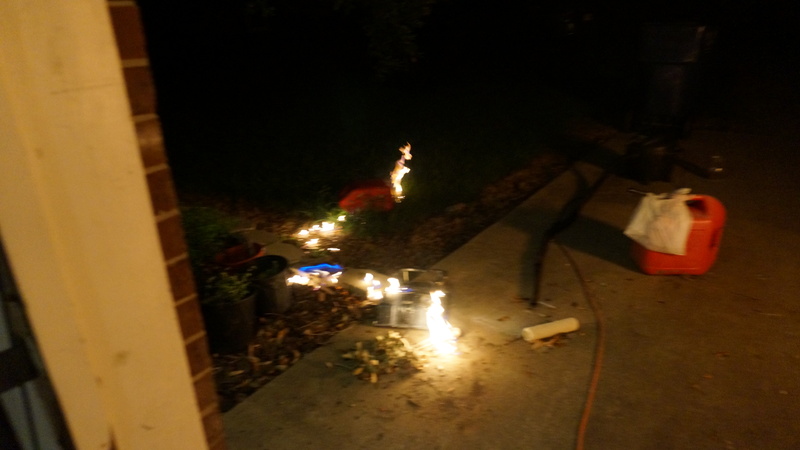 He then got a water hose and began to run it over the fiery areas on the ground closest to me and Josiah and then headed over to put out the flames on the actual can. The flames obliged, and we all started to breathe again! I immediately went in to “mom mode” and started lecturing Josiah (and BJ, too!) on fire safety. 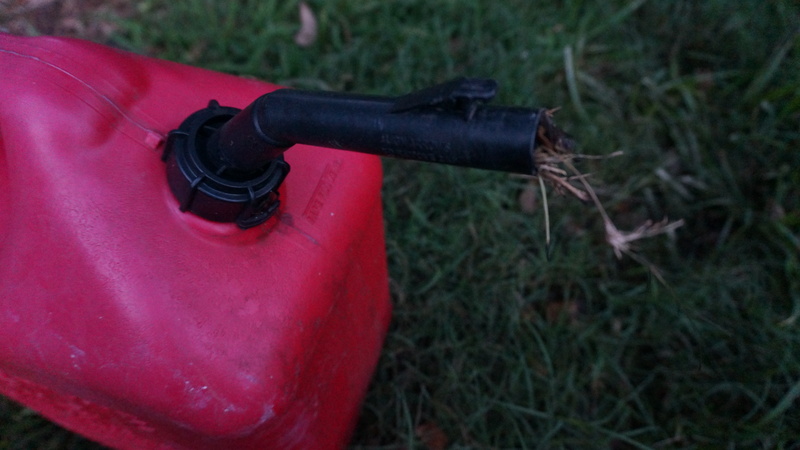 I think it was then that Josiah looked down and realized that there were TWO gas cans. Our normal gas can with gasoline in it had been sitting in its usual spot near the garage door. We were not even aware it was nearby due to it being pitch dark outside. BJ had brought the gas can with diesel in it from his storage building when he started the fire. Apparently, he unknowingly sat it down near the other one. In the darkness he grabbed the wrong can the second time. It finally made sense to him why the fire responded the way it did when he poured the fuel the second time and he told Josiah it was like a literal bomb that should have gone off on all of us. At that point, I still don’t think any of us were aware of how deadly that flaming gas can could have been. We thanked the Lord, came in and prayed over the girls, and went to bed. But it doesn’t end there! I went out to look at the gas can in the daylight the next day. The tip of the pouring spot that had been in flames the night before was stuffed full of earth as if dirt jammed up in it when it hit the ground in flames. The barrier of the earth between the open flames on and surrounding the can and the actual gasoline IN the can is what kept the can from exploding like a bomb next to us and two of our vehicles. The can itself appears to be untouched. No melting. No soot. No nothing. 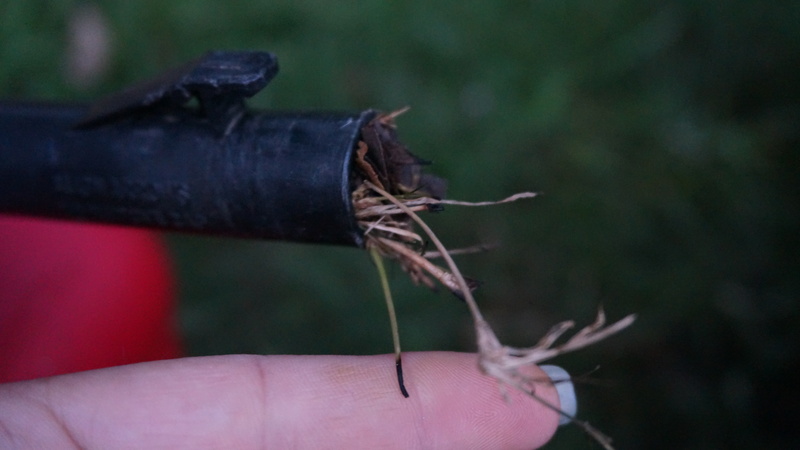 But if you look closely at the clod of dirt in the tip of the spout you will see that the flames did not even engulf the straw -like grass attached to the dirt. Yet, the very tips of the grass have the slightest bit of singe on them. Try and explain that! I SAW the fire THERE with my own eyes! The can was ablaze long before it made contact with earth to plug the spout and even then it lay on the ground in flames before BJ put the fire out. But even the grass in the blaze was singed only at its ends?!?! I cannot even find words to express how acutely aware God is of our circumstances and how intimately He is involved in our lives and how incredible undeniably perfect His timing is in all things! Even when we don’t have a clue what we’re up against, He is working behind the scenes for those that love Him and obey His commands and choose righteousness. So what can we learn from all of this? Everything that plays out here on earth in the physical realm is a direct manifestation of what is happening in the unseen spiritual realm. Just as real as the physical destruction awaiting our family Sunday night is spiritual destruction waiting for each and every one of us at every decision before us. Though you may not realize it, a battle is being fought for YOUR soul right now. The Bible makes it very clear which side wins in the end. Which side will you align yourself with? Which side will you help your children align with? A warning to those of you who have already chosen the winning side and are walking in a relationship with God through acceptance of Jesus Christ as your Savior: the loser can’t take you to hell but he can certainly make life on earth hell for you. Friends, parents, it is CRUCIAL that we realize that this battle is REAL! The enemy is out to destroy us and he’s out to take our kiddos down, too. Now, more than ever, we MUST press in and spend time in the word of God to strengthen ourselves against the enemy. He is targeting our families! We must spend time in prayer warring for our spouses and our children who are forced to live in a confusing world that calls right wrong and wrong right. We must teach our children the ways of God so that the only fire they’ll ever pass through is God’s refining fire. A warning to those of you who haven’t chosen a side yet: By being “undecided,” you automatically default to the losing side. Time is so, so short. Don’t put your eternity off. The Bible makes it clear that like a thief in the night a time will come when all of eternity is “set.” The righteous will forever remain righteous and the unrighteous forever unrighteous. No one will be able to switch sides. If you want to be on the winning side but don’t know how, it’s really not that complicated. It all boils down to this. As the Scriptures say, “No one is righteous—not even one. No one is truly wise; no one is seeking God. All have turned away; all have become useless. No one does good, not a single one.” … For everyone has sinned; we all fall short of God’s glorious standard. The price (or consequence) of our sin is death. Jesus died on the cross to pay the price for our sins and bridge our separation from God. Turning from sin and receiving Jesus’ forgiveness brings us into a relationship of peace with God. When we do this, we not only gain everlasting life with God after our physical death here on earth, but we also gain all of the “right now” earthly benefits He promises to those who are in covenant with Him. The key is not religion but a RELATIONSHIP with the Creator. It’s taking one day at a time, SPENDING TIME with the One who is holy, and becoming more pure, ourselves, in that process. Understand that as a sinner, you deserve death. Believe that Jesus Christ died on the cross to save you from your sin and from death. Repent by turning from your old life as a slave to sin to a new life submitted to God. Receive, through faith in Jesus Christ, God’s free gift of salvation. Spend time reading the Bible and building a relationship with God. Find a Bible believing church to get involved with so you can grow as a Christian. To close, I’d like to share a portion of a letter I wrote to our church family, The Remnant Church. I’m including it to share what “the church” is truly meant to be. It’s not “THE social place to be” or an obligation we must fulfil. It’s not a place of judgement to look down on others. It’s a group of believers that gather together not only to praise and worship God, learn His ways, and hear a relevant, timely message from Him, but also a place to lift and build each other up. It’s supposed to be a safe place. A place where everyone works together and uses the spiritual gifts God has given them to help those who are struggling. If you don’t have a church home that you can say this about, please know that you are always welcome at Remnant! BJ and I would like to express our extreme heartfelt gratitude for the prayers lifted up and agreement you gave for Josiah Sunday morning. We often take our Remnant “family” for granted but Sunday showed us just how invaluable being plugged in to the whole body of Christ truly is. Jim and Gay, thank you for loving our family unconditionally and always making yourself available for wise counsel. Shane, thank you so much for your sensitivity to the holy spirit’s leading. The prayer time that you initiated on Josiah’s behalf was no doubt God’s divine intervention in his life. It was truly life-changing. 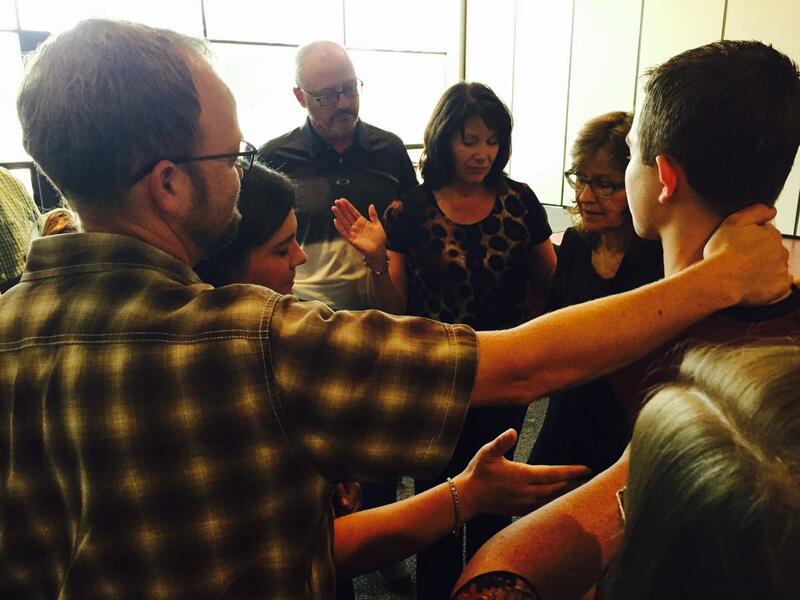 Mom, thank you for your humility and your deep desire to see Josiah set free. Donna, thank you for being a safe place for Josiah and for earning his trust. Cari, thank you for capturing a special moment in life for me as you know there is nothing I treasure more than being able to look back in time and remember. Remnant, the prayers you prayed that morning probably seemed pretty “normal” (or normal according to Remnant standards!) but know that God moved MIGHTILY at your request. You truly ARE his beloved and HAVE HIS EAR. (This photo was actually taken before the mixup with the gas cans. only singed on the ends???? 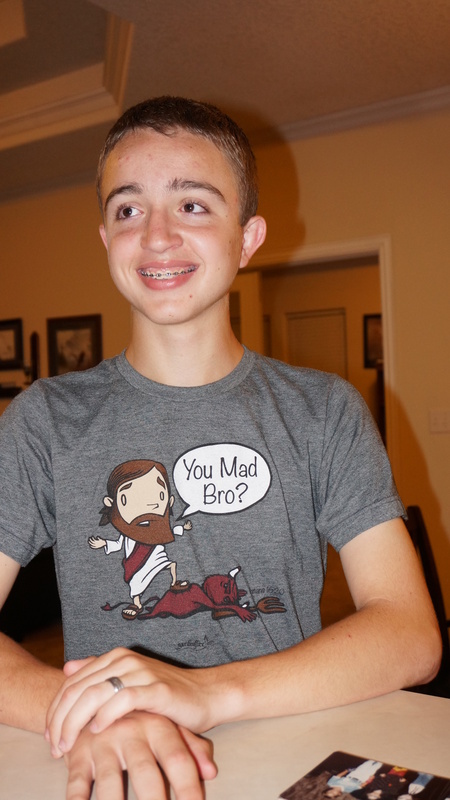 The t-shirt that Josiah happened to be wearing that night proved to be very fitting!